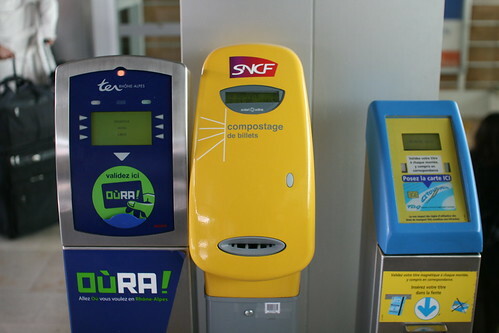 The vocabulary of interaction in this sequence of devices aimed at validating public transport cards in France: "validate here", "punch your ticket", "leave your card here". It's interesting to nice that only the "touch interface" explicitly tell people where to touch the card ("here"), whereas the "punch" interface (in french "compostage") does not have to specify where the interaction happen. Designers assume that if there's going to be something punched (a ticket) it can only be in the grey slit. it's also because people taking french trains have a long tradition of "punching" their tickets, as a sort of standard. The shape and size of the boxes themselves is also interesting. People who know the context will remark that the one that look very cheap (on the right) is the city transport one, the second smaller box (on the left) is for regional card and the yellow box in the middle is the national system.